Friday Recap | Survey Says... Results! You spoke, and we're listening! A few weeks ago, we asked you to help us Look Forward to 2014. Thank you so much for chiming in because you helped us shape some new features. It's great that everyone loved Swooned's MMBT-inspired one yesterday because since learning the survey results, I've been secretly been working hard on some T&T crafted ones. Keep your eyes peeled for February 6th! These actually were already in the works, so thank you for affirming that's what you do want to see! They're a-coming! Once I read this, I knew... this is such a huge, huge, huge piece of the wedding puzzle. It's been on the Topics list since I started that Topics list in July 2013, and it hasn't been done yet because I honestly was trying to figure out a way to do it justice AND not be overwhelming with information, especially because there are so many venues with so many features. But you all kicked me in the rear, and I've got some great local vendors helping and contributing to this special series! Be on the lookout in a few months! Have a hidden gem that we just MUST know about? Shoot me an email! People are asking for more giveaways! Are you a supplier or vendor looking for some ways to share your wedding wares and wisdom with others in Hampton Roads? Check out the Advertise page and drop me a line with your ideas. So this wasn't a completely huge Friday Recap, but I did want to be transparent with the behind the scenes actions happening! 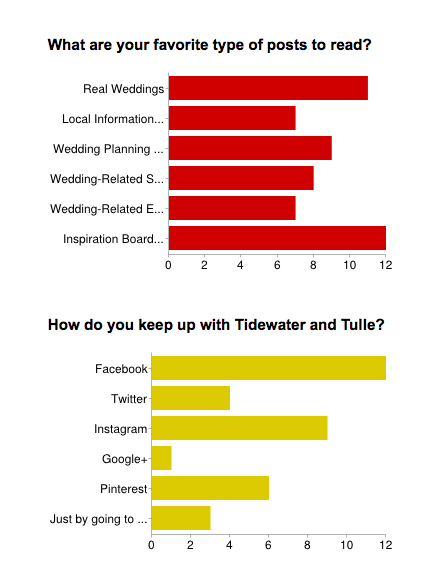 Thank you for supporting Tidewater and Tulle with your love, time, and thoughts! Come back on Monday for even more eye candy, information, and stories.